What a month it’s been for crafting! Not only did we feature lots of amazing DIY projects on the blog, we also had so many great projects by you uploaded to the Inspiration area. In this bumper blog post, we’re taking you through our top 9 crafts from January as well as the winners of our Monthly Competition, Craft of the Month and Project of the Month. We’re also announcing the winner of our Want it Win it competition from the 31st January, as well as the winner of the signed copy of Flowerbomb! by Hannah Read-Baldrey! Here’s our round up of our top nine crafts from January 2018 for you. Whether you missed these makes the first time round, or you’re looking for some inspiration – we’ve got lots of projects here for you to try. From baking to heat embossing, there’s something for everyone! Our first project of the year was our DIY Greetings Card Organiser. 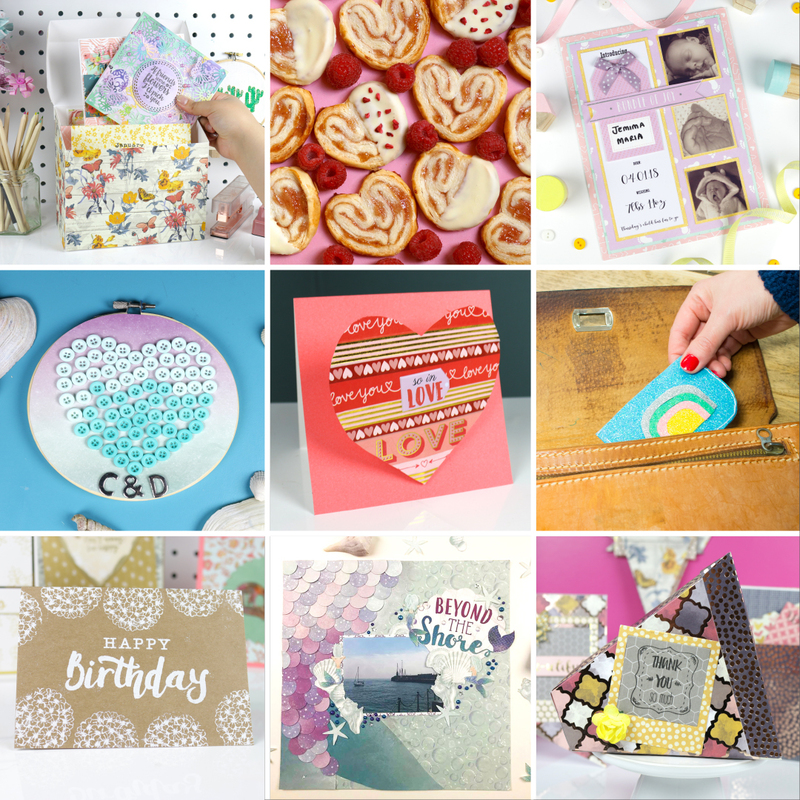 If you make or buy your greetings cards well in advance of the occasion and you’re in need of somewhere to store them our tutorial came to give you a helping hand! With 12 helpful dividers, this project allows you to store all of your greetings cards in preparation for the coming months – and we also provided a free template to make creating this super easy! Elle showed you how to create some perfect treats for Valentine’s Day (or any other day of the year for that matter)! These Valentine’s Palmiers sound super rather fancy but they’re surprisingly simple to make! Sharing the news of your new arrival couldn’t be easier with Kathy Hodson’s DIY Birth Announcement Card tutorial. Ideal for sending to your eagerly-awaiting loved ones to tell them that your bundle of joy has arrived, this card is made from the wonderful new collection from First Edition, Hey Baby. Ever wanted to try heat embossing but not sure where to start? We created a video tutorial showing you all of the basics and told you a few top tips and tricks to help get you well on the way to perfecting your heat embossing! Earlier in the month, Maxine showed you how to create this quick and fun Embroidery Hoop heart! Using just buttons and decorative paper, this make is perfect for beginners as the design is so simple to create. We are absolutely loving the Simply Creative glitter felt and we showed you how to create these cool DIY Card Wallets to help you keep track of your cards whilst on-the-go. We also provided a free template to make these card wallets super easy to create! We love getting the most out of our craft tools, and this fun tutorial showed you how to do just that! Using the We R Memory Keepers banner punch board, Maxine showed you how to make these fab projects. Our crafty team rounded up our 10 favourite fun and easy Valentine’s Crafts and put them all in one jam-packed video for you to follow at home. Whether you want to try them all, or you’re looking for a last-minute Valentine’s gift – we have something for everyone! Watch the video here. If you’ve ever wanted to start scrapbooking or are a seasoned scrapbooker looking for a fresh and new layout, Grace showed you how to create this magical Beyond the Shore design. In our tutorial, you can experience the whole scrapbooking process, from a blank sheet to complete page, so you can see the layout come to life! Which was your favourite tutorial from January? We’d love to see your versions of these makes so don’t forget to #Trimcraft when uploading to social media and to share your makes in the Inspiration area. Now it's time to announce the winners of our Monthly Competition, Craft Challenge and Project of the Month! Keep scrolling and you’ll also find out our Want it Win it Winner from the 31st January, as well as the winner the signed copy of Hannah Read-Baldrey’s Flowerbomb! book. Last month, we challenged you to create anything love-themed for this month’s craft challenge! We had so many lovely entries this month, however this beautiful project by Dido really stood out got us. Congratulations! Choosing the Project of the Month is always a difficult decision as we have SO many amazing craft projects to choose from in the Inspiration area. However, the lucky winner this month is Claire Gladman who created this wonderful Princess Shaker Card. Congratulations! Congratulations to [email protected] for winning this weeks Want It Win It competition. We hope you enjoy this lovely 12 x 12 Sweet Nothings Paper Pad! Winner of a signed copy of Hannah Read-Baldrey’s Flowerbomb! Thank you to everyone who entered our competition to win a signed copy of Hannah Read-Baldrey’s Flowerbomb! 25 beautiful craft projects to blow your blossoms. We’re really pleased to announce that the winner is Bellcat! Congratulations! Enjoy your wonderful new book. Don’t forget to enter our Monthly Competition for February, where you could be in with a chance of winning three new First Edition die sets! Congratulations Diana so clever well worth winner. Well done everyone. Diana your love is in the air was inspiring. Well done to all the winners. Especially Diana and Claire on your lovely projects. Congrats to all the winners!!! Awesome projects!!! WOUW thanks sooo much for pulling my name out and also a biiig congrats to all the other winners here as well. And biiiiig thanks to all in theshared all the amazing inspiration all this month. I hardly know, where to start, because there´s been sooo many amazing ideas almost every day. Congratulations to all winners! I particularly loved Dido’s Love themed hot air balloon card. Oh wow! Thank you very much and congratulations to all the other winners!! Aw, I wanted the Flower Bomb Book! ;-) Great inspiration again and I love the LOVE project, a deserved winner.